Those words may sound chilling, but they reflect a country that’s suffered several brutal jihadi attacks in recent years, and sees jihadi returnees as a threat. Other countries have come to the same conclusion. But Canadians who join the militant group have so far had little to fear from their own government, either at home or abroad. The British government has co-operated with the U.S. on drone strikes that killed two of Britain’s most notorious ISIS members: Mohammed Emwazi (aka Jihadi John) and Junaid Hussain. The Sunday Times reports that Britain’s Special Air Service, SAS, has been given a “kill list” of British jihadis, including notorious ISIS recruiter and convert Sally Jones, and a dozen others with British university degrees in technical fields such as electronics. France, too, is working to eradicate its jihadis overseas. A Wall Street Journal investigation published in May quoted French and Iraqi officials describing French special forces co-operating with Iraqi units to hunt down and kill French jihadis. But Canada is taking a different approach. “Canada does not engage in death squads,” Public Safety Minister Ralph Goodale told CBC’s Power & Politics on Friday. Goodale said anyone who poses a terrorist risk, homegrown or from elsewhere, is viewed “with the greatest of seriousness” by Canada’s intelligence, security and police agencies. Defence Minister Harjit Sajjan said his department’s job is ensuring foreign fighters don’t become a threat. “We will make sure that we put every type of resource into place so Canadians are well protected,” he told a crowd at the Halifax International Security Forum on Friday. These thugs don’t become a threat once they are vapourised. Hundreds of suspected Islamic State members swept up by Iraqi forces in Mosul are being held in a cramped and stifling prison just outside the city. Associated Press reporters visiting the facility saw more than 100 prisoners packed into a dark room, lined up shoulder to shoulder on the floor. There was no electricity or ventilation, despite daytime temperatures well over 45 C.
A French woman captured in the Iraqi city of Mosul with her four children is facing possible prosecution in Iraq for allegedly collaborating with the Islamic State group, in a test case for how governments handle the families of foreign fighters now that the extremists are in retreat. The fate of the children, ranging in age from 6 months to 8 years old, is in legal limbo. The father’s whereabouts are unknown. How Iraq and France choose to handle this family’s case could set a precedent for the many other foreigners who joined the IS cause. France alone estimates that 750 French people are among extremists in Iraq and Syria — including up to 450 children. The bodies of dozens of civilians killed in the past two days while fleeing an Islamic State-held neighborhood in Mosul lay on Saturday in a street close to the frontline with Iraqi armed forces, a Reuters TV crew reported. The dead included men, women and children. Bags in which they had carried their belongings were strewn around the road leading out of the Zanjili district, one of three still in the hands of Islamic State in Mosul. 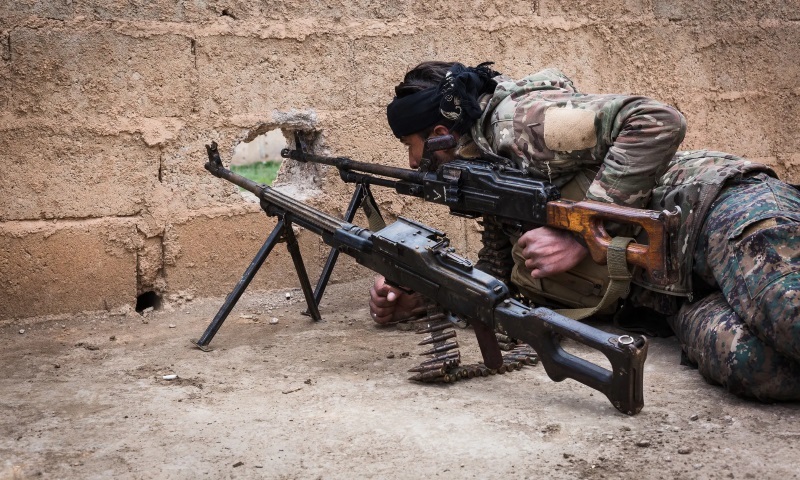 “Over the past two days ISIS has been shooting people escaping this area,” said Dave Eubank from the Free Burma Rangers relief association, referring to Islamic State, speaking from a building overlooking the frontline in Zanjili. What is more outrageous: Trump’s sarcasm or Obama’s willingness to let ISIS flourish? Russia’s largest warship, an aircraft carrier capable of carrying dozens of fighter jets, will launch airstrikes against the Islamic State of Iraq and the Levant in Syria, according to a source. The military diplomatic source told TASS, a Russian news agency, the Admiral Kuznetsov will be stationed in the Mediterranean Sea. Close to Syrian shores, Russia will work with pilots from Syria’s Khmeimim airbase to deliver the attacks. Increasing numbers of disenchanted Western ISIL fighters are appealing to their governments for help to return home, diplomats have reported. As fighting around ISIL’s strongholds intensifies and the group begins to lose swaths of territory, foreign jihadists are trying to defect in record numbers. More than 150 from six countries have in the past few months contacted their embassies in Turkey, which neighbours the Islamist group’s territory in Syria and Iraq. Western officials said they had received calls from inside Raqqa, ISIL’s self-styled capital, and even messages requesting help smuggled out on scraps of paper, according to the Wall Street Journal. It is thought that up to 1,700 French jihadists have returned home from fighting in Syria and Iraq since 2012. Britain and Germany have both seen around 800, a major cause for concern for European intelligence agencies. “We promise dark days to the states who have allied against Islamic State in reply to their aggression against our state. A replica of a 2,000-year-old Syrian arch which survived blasts by Isis will be erected in Trafalgar Square after being recreated using the world’s biggest 3D printer. The full-size recreation of the entrance to the Temple of Bel, one of the city of Palmyra’s most important monuments, is reportedly being built as a symbol of defiance against terrorists’ attempts to erase the Middle East’s pre-Islamic history. The monument was largely reduced to rubble by Islamist fighters, but one of its arches survived and the 15m-high structure, which stood at the temple’s entrance, remains standing. It’s a well-meaning hashtag at this point. When conductor Karl Eliasberg received instructions to rehearse Shostakovich’s Seventh Symphony he had a problem. After a performance the previous December of Tchaikovsky’s 1812 Overture – which depicts the Russia’s victory over Napoleon’s invading army – the only remaining orchestra in the city, the Leningrad Radio Orchestra, had shut down. So it was no surprise that when Eliasberg recalled his musicians for a rehearsal, only 15 turned up. In a stunning (who would this “stun”, exactly? We all know it’s the truth – ed) interview, the Maronite patriarch of Antioch, Cardinal Bechara Boutros al-Rahi, has contended that Islam has a clear, two-pronged strategy to take over Europe: religion and procreation. (By Thomas D. Williams, 6 November) The cardinal said that Muslims look on Christians as weak and believe that since they have no children and barely practice their faith, Islam will easily conquer them. Sadly, he said, Muslims take their faith more seriously than most Christians, and they are gaining ground because of it. …The Cardinal also said that Muslims “identify anything that comes from the West as Christian per se. All Western politics is Christian politics, it is a new crusade. They say that Christians are the remains of the Crusades and of Western imperialism,” he said. “This is a message to all the Jews, who are the Muslims’ number one enemy,” the masked jihadi says, wearing combat fatigues and holding an automatic weapon. This is Israel you’re talking to, ISIS. Egyptian Army prisoners surrendering to Israeli forces during the Six Day War. A 21-year-old hacker from Birmingham, England, who tapped into U.S. military networks and was a central figure in the Islamic State militant group’s online recruitment campaign has been killed in Syria by a U.S. airstrike, according to three senior U.S. officials. The hacker, Junaid Hussain, was a leading member of the CyberCaliphate, an Islamic State unit that broke into the U.S. Central Military Command’s Twitter and YouTube accounts this year. He was considered to be the second-most prominent British member of the Islamic State of Iraq and the Levant (ISIL), after Mohammed Emwazi, a fighter often referred to as “Jihadi John” because of his role in the videotaped killings of Western hostages.